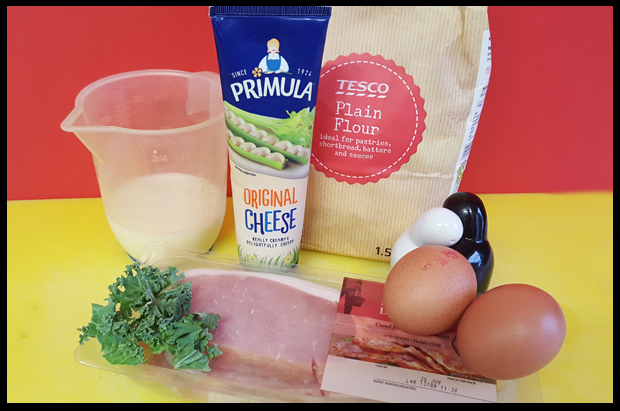 We are big fans of Primula in our house, and today I thought we'd try one of Primula's recipes rather than just squeezing the cheese on crackers. Don't get me wrong, I think that's a wonderful way to eat Primula, but every once in a while it's nice to experiment. The chefs at Primula Cheese have created a brand new selection of flavoursome snacks which are perfect for summer. From cheesy parsnip mash to mini breakfast frittatas, but the one that I loved the sound of was "Dutch Baby" with Bacon, Kale and Cheese (not so sure on the kale). Never heard of Dutch baby before, but oh my days! Isn't that delicious!! A Dutch baby is somewhere in between a Yorkshire pudding and a pancake. Filled with yummy Primula Cheese, delicious bacon and crunchy kale (another new for me, I actually loved the kale in this too). I made it! Didn't look as fabulous as the image above but it went down very well with my two men of the house, and will be for sure, adding this to our menu! Fry kale in olive oil over high heat, until edges start to crisp. Season well with salt & pepper. Do let me know if you try this one, I'm really pleasantly pleased with how mine turned out!